The Member Check In Page is where you can easily check members in at your location using Operate and where you can keep track of the time everyone has used from their plan. To install this feature, go to Settings > Integrations > Member and find Member Check In in the list. Click Install to install the app. You can then click Open to access the page from within this section. To access the Member Check In Page later on, go to Member > Member Check In, in the main navigation menu. Next, simply click on the location you need. Member Search - Simply use the search box to search by contact or account name. Searching for a specific contact name will display that particular contact. Searching for an Account name will display all contacts associated to that account. Searching for part of a name will display all of the contact and/or accounts containing the search term you have entered. List Checked In Members - Press the Checked In Members button to display a list of all members who are currently checked in at your location. Change Location - This button allows you to change the location for which you are viewing members. Check Members In/out at your location. You can check Members in using the Check in button on the right of each listed member. 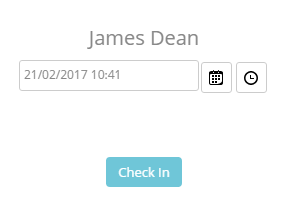 When a member has already been checked in, the button will turn into Check Out. Once pressing this button (regardless of whether you are checking the member in or out), you will be directed to a screen that allows you to set the date and time when the user has checked in/out. If a member is not checked out manually they are auto checked out at the end of the day. If the member has a meeting plan in place, their hours WILL be used. The date since when the member has been active. Important Notes regarding the member - Here you can simply add your notes in the text box. The location where the member has been checked in. Time related information is retrieved from your time based plans and refreshed every month. Read more about time based products here. To view the times when a particular member has checked in/out, you can do so by going to their contact profile under Member > Contacts. Here is where you will find an Access History section, which can list this information. If you do not have this section or the "Time Checked In" and 'Time Checked Out' columns, please edit the Contact Page Layout (Settings > General > Customize > Contacts > Page Layouts). Scroll to the Access History Section, tick the 'Visible' box to display it on your contact pages, then click 'Choose Columns' to select the columns you need displayed. Read the page layout customization guide to learn more about editing them. To view check in/out times for all of your contacts in one go, you can run a report. Go to Reports, click New and expand Contacts in the list. Select Contacts and Access History. In the report builder, search for the 'Time Checked In' and 'Time Checked Out' columns, then drag each on your report. You can make any other adjustments you need and save the report for later use. Learn more about building your reports in Operate. It is possible to send the Member Check In module information via the Operate API from 3rd party systems such as door access controllers and Wi-Fi. Through these API calls you can check people in and out of your centre, however any logic to summarise the movements of a user and class them as checked in or checked out will need to be performed outside of Operate. For example, a user within your site who is on the Wi-Fi will likely connect and disconnect dozens of times as their devices go to sleep and wake up. If this action is sent to Operate every time it happens, Operate will class this as the user checking into and checking out of the site. To overcome this, your Wi-Fi solution would need to summarise these many actions into a handful, to then drive your business rules around when a user has checked in and checked out.